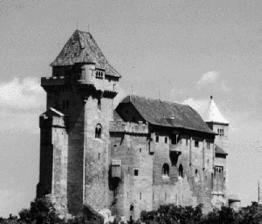 GRABESMOND was formed in 1995 by Peter (ABIGOR, HEIDENREICH), and Protector/ Richard Lederer (SUMMONING, DIE VERBANNTEN KINDER EVA`S, ICEAGES). They released a limited demo, entitled In schwindendem Licht, in summer 1995. Even they got several offers for a deal they spilt the band because of their main bands, and the resulting lack of time. Explain what the word 'Grabesmond' means and why it was chosen? One can't translate the name GRABESMOND that exactly... The best fitting translation is Funeral Moon. The name was chosen because they want to express some more personal, and dark thoughts, as well explore non Metal music, so the name GRABESMOND fit it best, because it represents a kind of hidden mysterium. Its a rather unique situation, the existence of Grabesmond. It was formed by Peter (Abigor, Heidenreich, etc.) and Protector but after releasing a demo they broke up. How and why did you go about resurrecting it? Why did you choose to take on the name of Grabesmond, rather then just making a new name? As I came to Austria in 1996 I met Peter, and he told me about GRABESMOND, and because I was interested to start a new band, I thought GRABESMOND would be the best solution, even though the band split up a year ago. GRABESMOND is a name that fits the best to my art, and the thoughts I want to express through it, that's the main reason why I decided to use the name. Your latest release, 'Mordenheim,' contains no vocals. As the inlay card reads, 'Sometimes words cannot describe what a soul feels.' Could you further describe the motivation behind this? Mordenheim is a journey through the spheres beyond time, a journey within my mind, and the music shall create an atmosphere that inspires every individual to let the emotions fly free. I never thought to use vocals on Mordenheim, because it was important for me to express thoughts and emotions through music, and not through usual words. One can see it as a soundtrack that guides you through the realms of fantasy. Will the next release contain vocals? Are you working on material for the next release now and what can we expect? What emotions do you wish to invoke within the listener? 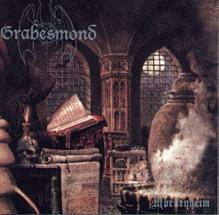 The music of Grabesmond is very dark and foreboding at times... what elements of your life inspire your music? What are some of the things in life you hate the most. In contrast, what are some of the things you love in this life? Do you find the saying , 'Everything in life worth living for, is also worth dying for' true? One thing I hate the most are human beings and their morals, as well as their curiosity, and their kind of one-way living, like machines they've a programmed life without any deeper sense. But there are a lot more things I can't stand, or that I even hate, but I think it would be too much. The things I love (need) is nature, my inner silence, and my animals. Some more money would be great too... It's difficult to agree with that statement, I think it depends on what one own, and fulfill with her/his live. What are some of the things you like to do in your spare time? Hobbies or interests? I try to be out in nature every free minute, but it isn't possible all the time. Besides that I like to read a good book, and my main interest is music, and to explore the realms of magic and occultism. Also I like reptiles, and amphibians, which content to my main part of interest. What do you think about Christianity? There is a prominent hatred for it in the underground music scene, what would you say is the cause of this? In my opinion Christianity is a religion of lies, and falseness. They were unable to establish their views and laws, so they stole a main part of our ancestor's heritage. And nowadays the church denies the perpetration's of the past, and that's truly wrong, and it underlines their weakness too. I don't care if there is a kind of prominent hatred against Christianity within the music scene. What about Satanism and paganism? Any of these things interest you, if so, why? Satanism is not that bad, but in some cases it isn't better than Christianity, because some orders are based on this - follow the laws, and the rules of your master - and that is in my opinion not Satanism, because the entire individualism and power of the `Satanist´ get lost. Also too much people sill don't know that there's a main difference between the pseudo Black-Metal Satanists and the true worshippers of Satan, even there'll be for sure some real ones within the Black-Metal scene too, but 90% are false. 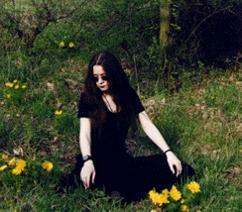 Personally I am more addicted to paganism, because it was the first, and true `religion´. It was and still is free and the underlines the freedom of the soul, and the equilibrium of the individual and the powers of nature. As often as its possible I try to celebrate the heathen holidays with my husband, and to live the way our ancestors did. In Austria there are a lot of festival that were in their real sense heathen but Christianity infected the heart of Europe and destroyed it, and changed it to praise their idol of fools. There are a lot of new bands these days... any of them interest you? Explain your relationship with Peter of Abigor. How did you meet him and are you good friends with him? I am from Sweden, and I met Peter several years ago. Yes, more or less he is a very good friend of mine, because he is my husband. If there were one question you could ask some 'all-knowing being,' what would it be? If I don't know a better question I would ask - what can you do for me? There seems to be a lot of crisis in the world today. Looking back at history, a war is bound to happen eventually. With the additions of nuclear, chemical and biological weapons added to man's arsenal of weaponry, and the availability of these things, the world could easily face its fiery end in a matter of hours. What do you think about this topic? Do you share the vision of a dying world with so many others? Do you see hope for the world and its future? Or will things get much worse as time passes? Of course things will get much worse, that's sure. But I don't care too much about it, because it is what mankind deserves, but I hope that I am already old, or even dead at this time. Some of the seemingly easy things to find in life, such as friendship and truth, are often the most scarce and difficult to obtain. The moral fabrics of the world are in constant decay. Where do you feel things went wrong? I don't know, nor do I care about it, I've no moral, but I honour friendship and truth a lot. I think every person is the master of their own life, so every person on this planet set it's mark to this constant decay. Where is your favorite place to go in this world? Somewhere out in the nature, maybe as a kind of hermit, or the master of the world would fit too. Alas, if there was a meaning to life, what is it through your perspective? The real meaning of life is to propagate, but there are some individuals that step over the line to reach higher destinations, even they are just a few indeed. Final comments or questions ? Thank you for some unusually interesting questions.